Bacteria. From surgeons to health inspectors to moms of runny-nosed kids, over 400 years of medical research and experience have taught us the wrong kind of bug can trigger infection, spoil our food and make us sick. But bacteria, and more specifically, our microbiota, may be linked to our health. Thanks to an explosion of new research, bacteria’s image has received a Hollywood-style makeover. 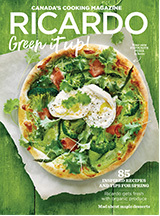 Suddenly, instead of viewing bacteria as bad (you still shouldn’t leave your egg salad out in the sun all day—see why on p. 23), we now understand that naturally occurring microbes (of which bacteria is one type) can be important—even essential—to our digestion, our immune system and even our ability to maintain a healthy weight. With this new information on the role of microbes and our health (and especially if you’re hearing the word “microbiota” for the first time), now is the perfect moment to learn about what scientists call our microbiome. First coined in 2001, the term microbiome refers to the entire habitat—including the genetic material—of the microbes we host, while the term microbiota refers to the actual microbes themselves. While many of these little critters exist on our skin, the vast majority of the microbes we house are bacteria found in our digestive system. Make no mistake, our microbiome is massive: It’s estimated that the average human hosts between 10 and 100 trillion (trillion!) microbes. Our microbiomes are also as unique as we are. They can vary up to 90% from person to person—even in identical twins—and are so distinct that researchers have been able to determine, with near perfect accuracy, a person’s identity by examining the genes on a computer mouse. Simply put, our microbiome is like a bacterial fingerprint. Our microbiota—the microscopic microbes that are on our skin and inside of us—are very busy! In fact, it’s their mere existence that keeps us healthy: By living in our digestive system, these microbes naturally block out nasty intruders that can potentially make us sick. Bacteria like Lactobacillus—that’s the type of bacteria found in yogurt—produce compounds that keep unwanted bacteria from growing and thriving. Bacteria in our gut can help us break down certain types of fibre that we would otherwise be unable to digest. The by-products of this digestion include short-chain fatty acids, vitamins B1, B12 and K, folic acid and small compounds that are thought to support our immune system—possibly even reducing our risk of chronic diseases like cancer. Specific fibres, such as beta-glucan (the type of fibre found in barley and oats) could even be keeping us healthy by feeding bacteria that are thought to prevent obesity. There’s also evidence that our weight and metabolism are linked to our microbiota, supported by preliminary research that a certain bacterial strain can lead to increased appetite, whereas other strains can lead to increased calorie extraction and absorption—both of which can cause weight gain over time. What factors affect our microbiota? The makeup of our microbiota starts, quite literally, the second we enter the world: The process of travelling through the birth canal imparts a mother’s microbiota onto her newborn baby. While babies born by C-section don’t have the same immediate exposure to mom’s bacteria (they can gradually pick up her microbes through skin-to-skin activities such as breastfeeding), there are many studies under way aimed at improving this situation. Our young microbiota does not remain static, either: The simple act of introducing new foods, like meats or grains, to a baby’s or toddler’s diet adds to the already existing microbiota, and in turn eases digestion of these foods. 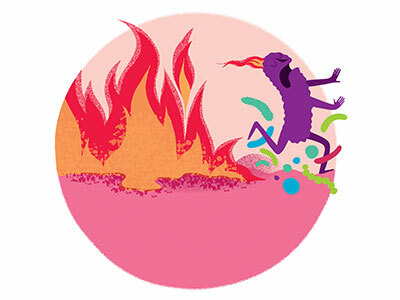 By the age of three, our microbiota is pretty much what it will look like for the rest of our life, keeping in mind that some things can alter this over time. (See foods for a healthy microbiome at right). The environment we live in plays a role in the types of bacteria we house. People who share the same household, or who even spend a lot of time together, tend to have unique yet similar microbiomes. For years, researchers have been intrigued by data suggesting that children who live on farms tend to have a lower risk of allergies than urban-dwelling kids; it’s now believed that the exposure to a wide range of microbes (i.e., in a more rural environment) can have positive influences on our immune system early on. The food we eat, our exposure to animals and even the part of the world we live in can also affect our microbiota. We also know that certain factors that reduce our bacterial diversity, like some types of medications (for example, medications used to reduce stomach acid for people with heartburn), could make people more prone to illness or infection in the long run, possibly because the medication reduces our bacterial diversity (see sidebar). It’s still hard to tell which members of our microscopic internal community are the most beneficial to our health. Our microbiota plays a lot of important roles, many of which we aren’t even aware of yet. For the moment, it’s impossible to determine what makes up a “good” or “bad” microbiota, as two perfectly healthy people can have completely different bacterial makeups. Despite this, it’s believed that for a diverse array of micro-organisms, we need to maintain a diverse, healthy diet. That being said, we still don’t know if a reduction in the array of our microbiota is what provokes health problems, or the reverse—that poor health has an influence on our microbiota’s diversity. It’s a bit like the chicken-and-the-egg conundrum. Antibiotics are important for treating a number of bacterial infections, but often these medications act a bit like a fire, destroying everything in their path. Not only is the undesirable bacteria wiped out, but the good bacteria that inhabits our digestive tract is also at risk. Antibiotics reduce the diversity of our microbiota and some bacterial strains can even disappear forever. It’s extremely important to follow the advice of your doctor or health practitioner, but these findings could influence general antibiotic use in the future. There are certain bacteria that produce inflammatory substances, while others create molecules that can be toxic for those in our digestive system. Our intestinal membrane can be damaged by these substances and become even more porous, much like a sieve, letting molecules fall through that shouldn’t. That’s when the body starts to react, and many scientists believe this is the root of certain health problems, such as inflammatory bowel diseases like Crohn’s or ulcerative colitis, where an unbalanced microbiota produces a surplus of inflammatory substances. 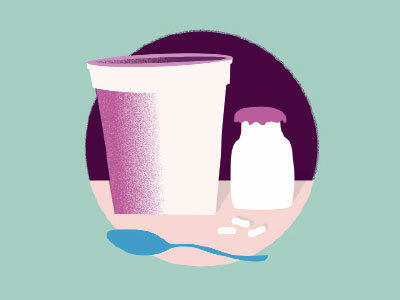 Like all living things, bacteria need to eat, and that’s exactly what prebiotics are for: They are food for probiotics. In general, prebiotics are found in vegetables, fruit, beans and whole grains, but specific prebiotics, like inulin (a type of fibre derived from chicory) are increasingly being added to granola bars, oatmeal and yogurt to bump up their fibre—and prebiotic—content, and appeal to health-conscious consumers. Leeks, asparagus, artichokes, garlic and whole grains are among foods that contain the most prebiotics. Fibre is important to our intestinal flora because it’s our microbiota’s favourite thing to eat. The best way to ingest fibre is by keeping it simple and eating a selection of food where it naturally occurs: legumes, nuts, seeds, whole grains and vegetables. It’s no secret that the North American diet is filled with processed foods and those high in saturated fat, salt and sugar—all of which are often associated with chronic diseases. Research tells us that people who follow these types of diets are more likely to have a less diversified microbiota than those who eat a more balanced diet (full of lean proteins, vegetables, whole grains and fruit). Likewise, some research suggests artificial sweeteners discourage the growth of healthy bacteria—all the more reason to ditch the diet soda! Probiotic supplements are often used to manage digestive concerns, like bloating or gas, and certain strains are even thought to help relieve the discomfort of irritable bowel syndrome, a condition that affects an estimated 15% of Canadians. If you do decide to try a probiotic, be sure to speak with your doctor or health-care practitioner before taking anything to be certain which one is right for you.